With the TAdvGridRTFIO component it is possible to export a grid to a RTF file without the need to have any other software installed such as MS Word. 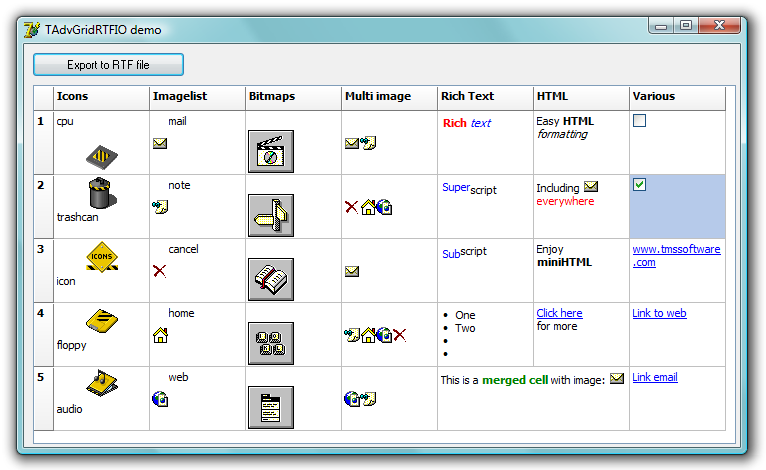 TAdvGridRTFIO is an add-on component that is included with TAdvStringGrid. It is a separate component and as such, when not used, the RTF capabilities do not increase your application executable size unnecessarily. Using TAdvGridRTFIO is very simple. Drop the component on the form and assign your TAdvStringGrid or descendent component to the TAdvGridRTFIO.AdvStringGrid property. Call TAdvGridRTFIO.ExportRTF(FileName) to do the actual export. GridStartCol, GridStartRow: sets the top left row from where the export should start. With this property you can control whether fixed cells are exported or not. without the rich text attributes. The project and source files have been written with Delphi 6,7. To use these files in other versions of Delphi, ignore any remarks when opening the form files and save the files. After this, compilation can be done. The error messages are due to properties included in the Delphi 6 form file, but not available in lower versions of Delphi.